Churchill Brothers Sports Club went down fighting as Minerva Punjab Football Club came out victorious in the nine-goal thriller in the I-League match played at Tilak Maidan, Vasco earlier on Sunday. Minerva coach Surinder Singh was happy man after his side collected full points against the Red Machines. 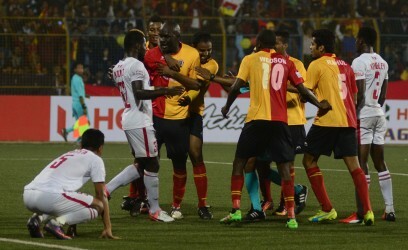 The 43-year-old coach praised the performance of the boys. “Both the team needed points and both the team were going out (for the full points) and were playing attacking football. I guess the crowd must have enjoyed nine goals today. I am happy with the performance of my team as they never gave up and they played bravely,” Singh said in the post-match press interaction. However he also said that they were lacking at set-pieces and need to work on the same. “We conceded goals in the set-pieces, so we need to work on that department.” the former Pailan Arrows assistant explained. Meanwhile, Churchill’s newly appointed Coach Derrick Pereira was not happy with the defense line and also pointed out that it needed to improve.